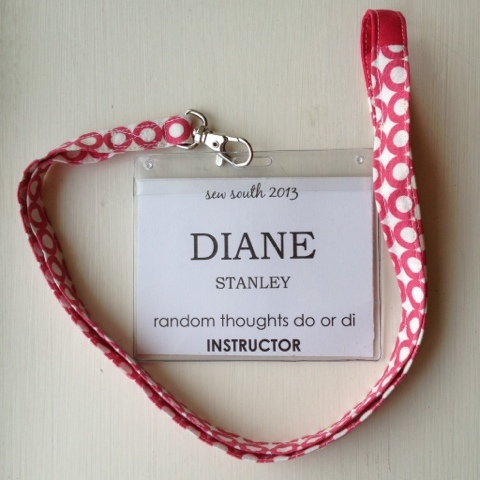 Call me crazy, but when I received my name tag on the first day at the Sew South Retreat and saw "Instructor" under my name my stomach did a flip and my heart skipped a beat. I can't tell you how nervous and excited I was to teach my class. 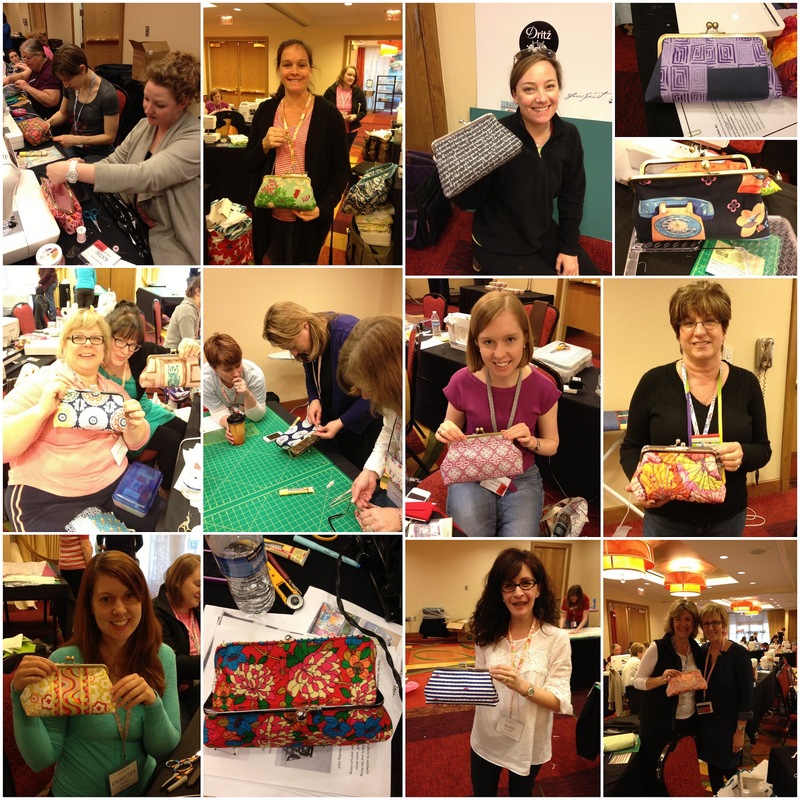 Six months ago, when Jennifer and I first talked about me teaching the framed clutch purse class I did not have a lot of confidence in my teaching skills. 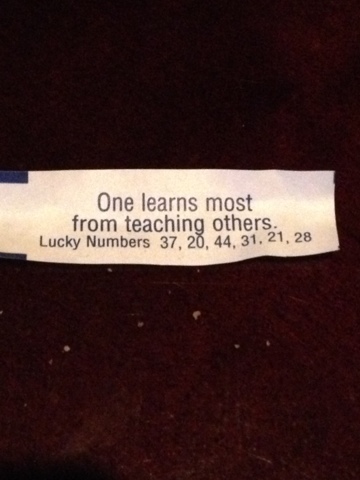 The night before I was to teach, a large group of us went to dinner at PF Chang's and this was in my fortune cookie. Seriously? After that moment I was no longer nervous, but confident that the class was going to be a hit. It certainly was. You can tell by the beautiful clutch purses that everyone created. Here I am, "proud mama", with all the beautiful clutch bags everyone created. You can't see the tears, but I was so overwhelmed that my class was so well received and everyone created such beautiful purses. Thank you to Pellon (for the interfacing and Thermolam) and While Baby Naps (for donating the frames) for sponsoring this class. Their products make this clutch so much easier to make. If you would like to make this clutch, my pattern is for sale on Craftsy...see the link on my sidebar. I've been admiring those clutches for days. I've owned some frames for a little bit, but am nervous to attempt making anything from them. I bet a class taught by yourself would take away the nervousness in a heartbeat! Glad that you had a wonderful time. Congrats Di! Wish I could have been a student of yours! I love your pattern, definitely need to get some frames so I can give it a try!! I love that photo of you with all the clutches that were made. You are obviously a most excellent teacher! Ahh, we can say we knew you when :o) They all did a great job, you obviously taught them well! Oh I feel like a proud mama, well friend looking at you with all the purses :) I've only read wonderful things about your class we knew you could do it! Such a terrific feeling I BET!!! You did a GREAT job! Thank you for your help and encouragement while we made our clutches. 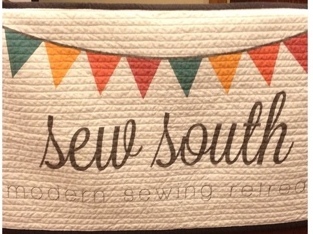 It was a super fun project and your pattern was fantastic- thank you for showing us how to do it- they look so awesome! What a sense of achievement! Congratulations Di! I hope you took a lottery ticket out with those numbers too! How prophetic! I agree with Jennifer, you did a wonderful job. I'm so proud of you. I loved your clutch class! Your pattern (and your clear instruction) made something that seemed super scary and hard to do, very very easy! I loved watching everyone gush over their new adorable clutches, and I know I'll be making these as gifts! I must have missed this post earlier. I thrilled everything went well for you - there's no stopping you now!